Ben Davis junior Bria Goss (right) has been named one of 60 players nationwide to the ESPN Rise Underclass All-American Girls Basketball Team. 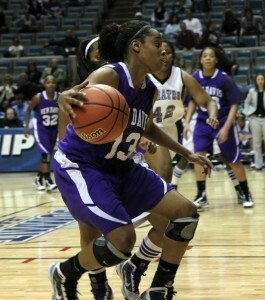 Goss, a 5’10 wing, has helped Ben Davis to consecutive 4A state championships and undefeated seasons under head coach Stan Benge. As a sophomore, Goss hit an off-balance game winner to give the Giants an exciting state championship victory over South Bend Washington. During her three-year prep career, Goss has lost only two games in 84 outings. As a junior, Goss averaged 15.7 points, 6.7 rebounds and 4.0 assists per game, while shooting 52.0% from the field, 45.5% from three-point and 82.9% from the line. She was the Giants’ leading scorer during the 2009-10 season and was named All-MIC, All-County, All-State and a Junior All-Star (Core). Goss is being highly recruited by a number of quality D-I programs, but is as yet undecided on her college choice. The Rise Underclass Players of the Year include junior Kaleena Mosqueda-Lewis of Mater Dei (CA), sophomore Morgan Tuck of Bolingbrook (IL) and Diamond DeShields of Norcross (GA). Former ESPN Rise Underclass Players of the Year from Indiana include Skylar Diggins (junior & sophomore years) of South Bend Washington and Ta’Shia Phillips of Brebeuf (freshman year).